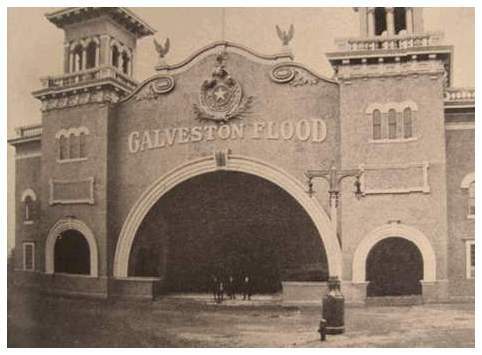 The hurricane that hit Galveston Island was the deadliest natural disaster that the United States has ever experienced. With a population of 37,789; the island-city and port of Galveston, (nicknamed the "Wall Street of the Southwest), " was the main port for exporting and trading of cotton for most of the southwestern United States. It was considered a growing and well-to-do city, on its way up. Though Galvestonians knew about the oncoming storm, they were calmed by officials into not evacuating. On September 8, 1900 In 1990, the hurricane hit full-force, the island which was at most 8 feet above sea level, battered the city with 140 miles per hour winds. A steamship smashed into 3 bridges, destroying any last-minute hope of escape. Floodwaters were 20 feet high. After the storm subsided, not a single building on the island avoided damage. 6,000 to 10,000 men, women and children died and another six thousand were badly injured. 2,636 homes were lost. As the `Great Flood’ was only four ago (and still fresh in most people’s minds), the World’s Fair officials were sensitive to the gruesome carnage that the catastrophe depicted. 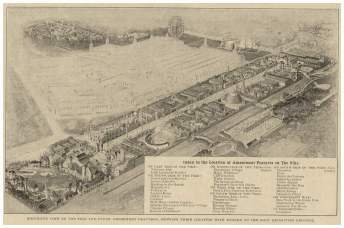 On the stage of the large hall the fairgoers could view the city of Galveston reproduced in grand scale. Miniatures were masterly combined with murals to join a quite realistic look. Boats sailed, trains crossed Galveston bridge via bridge, the sun was shining, electric cars passed through the streets. All was calm. Then, the clouds gathered, and the wind and the rain began their bombardment of the city-island. Through dramatic narration, miniatures, water lighting and special effects, attractions illustrated the enormous power of mother nature. The city was in ruins. But the show did not end on a sad, bleak note, they depicted a better and brighter new Galveston, rebuilt by American resources and courage. This attraction was a near-identical one at New Jersey’s Luna Park.